Samarkand became a major papermaking centre after the Arab Caliphate won the mighty Battle of Talas (in present day Kyrgyzstan) against the Chinese Tang dynasty in 751 A.D. Legend has it that the production secret was revealed by two captured Chinese soldiers, who happened to be paper makers. Water and wind power were used to operate the mills, which pounded mulberry bark, cotton, and waste from cotton and silk production. From the 10th century, mulberry replaced all other materials as it was pest resistant, flexible and durable. These qualities met the needs of Islamic calligraphers. 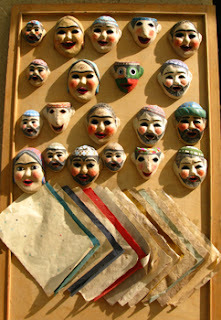 The paper was renowned for its light color and fragrances, derived from adding henna and rosewater to the process. From Samarkand, papermaking spread to Baghdad, Damascus, and Cairo. By 900 A.D. bookshops and even public lending libraries existed in the Arab world. Paper entered Europe in the 12th century, after North African Moors conquered Spain and Portugal carrying the process with them. The revered 15th century Uzbek poet, thinker and scientist Alisher Navoi called Samarkand paper "the wings that spread the thoughts of wise people to the world". By the 19th century, however, the skills were lost with the importation of cheap Russian paper. Fast forward to the mid-1990s, when Uzbek miniature painters faced a critical shortage of suitable paper for their work: local artisan Zarif Muhtarov resolved to revive handmade paper. With the support of UNESCO and JICA, a suitable site in the village of Koni Gil,10 kms from Samarkand, was identified. 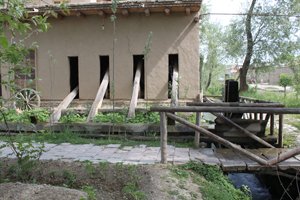 A traditional water mill was constructed, fed by the clear waters of the Siob river. Mulberry bark provides the fibre, an ingenious system of simple water-driven machinery is used to pound the stripped bark into the desired softness and a dedicated band of apprentices works with Usto (master) Muhtarov to create sheets of hand-made paper. Once again Samarkand paper is being produced using traditional methods. Demand for the paper is growing, particularly in the field of restoration of Korans. Usto Muhtarov and his team also experiment with new products that will appeal to tourists who visit. As well as beautiful cards painted with suzani designs, I bought adorable bookmarks there this year, in the shape of Uzbek women with round non (bread) piled on their heads. 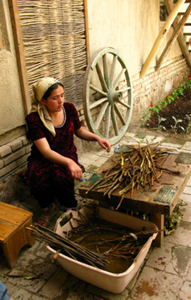 On Uzbek Journeys tours you will visit Koni Gil, view the production process and enjoy a green tea in the shaded grounds of this lovely workshop.